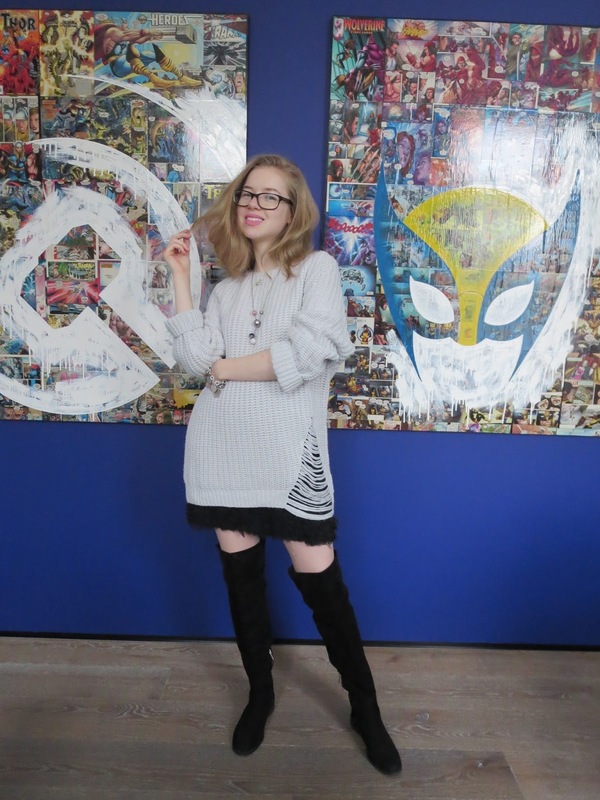 Today I wanted to style my elegant fluffy skirt a little bit more casual and wearable, so I went for an oversized comfy sweater and over the knee boots. To be fair I was missing them, I'm totally in love with the style and on the hunt for other similar pairs. I would love to add a high heeled pair to my shoe collection. Anyway...back to the outfit, in case you didn't know my favourite jewellery are silver pieces, so I added some to the outfit as the finishing touches. The long necklace comes from a collection titled "Chaos", which strangely enough made me love the necklace even more. Weird, I know, but sometimes small details make me love things more. What do you think about the outfit? Great outfit! Love the boots and the necklace! Your sweater is such an amazing cool piece! This is such a cute outfit! Looks so cozy. That sweater is sick. I love it. It reminds of something Gwen Stefani would wear or even Pink. I guess what I'm trying to say is that, it's got edge. I love the threading....not your typical crew neck sweater. Then pair it with that super cute skirt. You look fantastic! Super cute outfit, love the sweater!! You are the cutest my love. Lovin the skirt and OTK combo. Love the skirt! Love the top! Love your boots! You looks so nice in this outfit! You look so cute and pretty in your outfit! Lovely outfit, I adore necklace! Love that sweater and that little dropped needle detail! I love your shredded sweater Carina! Great bracelet too! Lovin' this chic look, the OTK boots are to die for! Esas botas te sientan genial!!! You look soooo cute! Loving this neutral combo and that sweater is fun!! I love that sweater, and I especially like those posters. Very Geek Chic. It's such a cute fluffy skirt! Sul mio blog http://www.littlefairyfashion.com "Blu e verde……colore e comodità"
Stunning look! Love your style! Great styling, love the jumper!! You look so edgy and chic. Am loving the fluffy skirt and the sweater knit top, the boots add pizzazz to the outfit. You look stunning dear.